I am using the term ‘framework’ loosely. I think no one really knows what the massive gradual transition to social computing and collaboration as core work activities means in practical terms for today’s (and tomorrow’s) human resources professionals and the people management processes and practices they design, search implement, decease coach and manage. … the basics of human resources management goals and practices have remained little changed, philosophically and practically. The main metaphor today’s HR professionals live in is still a machine with its designed-and-fitted parts and cogs, as opposed to the ‘living’ system of social networks in which people participate and interact. This dominant metaphor leads to language such as optimization, alignment, productivity and control. Let me be clear … in an enterprise setting, these are unequivocally good things to seek and realize. However, the basic vocabulary of intention, methods and practices that can create these characteristics in a networked environment may be different. 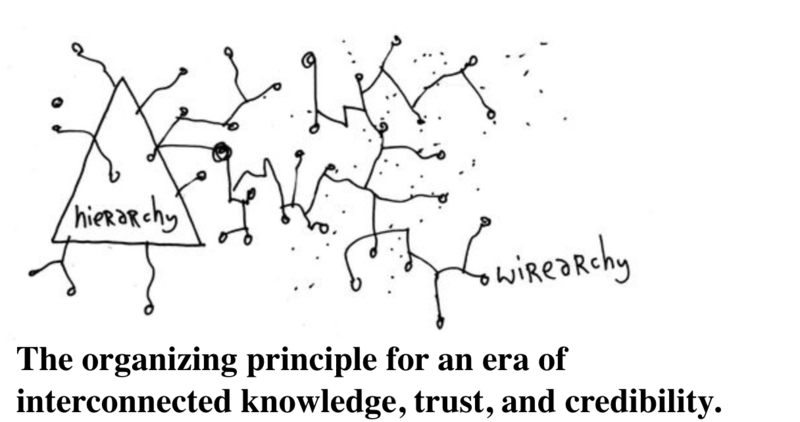 In electronically connected networks where we “work at the speed of light” (McLuhan), different thinking and ways of working are necessary, and a new vocabulary may be very useful with respect to advancing on what we now have and use. The notion of purposeful social computing in and by workers (and customers) in an enterprise setting developed out of the rise and growth of what has come to be known as Web 2.0, and was termed Enterprise 2.0 about three and a half years ago. Given that it arose from the welter of confusing-to-many activities that defined Web 2.0 (participation, interaction and sharing) I have often wondered if the term itself has been more of a hindrance than a help when making decisions about whether, why and how to put social computing and the potential of social networks into play in any given organization. However, the dynamics are here to stay, and acquire more and more legitimacy all the time, thanks largely to the pioneering work of several thought-and-practice leaders and an excellent summary of the issues and examples to date in a new book titled Enterprise 2.0 – New Collaborative Tools for Your Enterprise’s Toughest Challenges, by Andrew McAfee (widely known as coiner of the term “Enterprise 2.0? So … what about HR 2.0 for the Enterprise 2.0 ? Human resources management is supposed to be about finding, attracting, engaging, motivating, and retaining (helping to grow / evolve ?) the best available talent. In an era increasingly defined by information, knowledge and more recently participation, engagement, relationships, influence, etc., people who are talented, imaginative, creative, honest and hard-working often remain an elusive and slippery target. Much of the foundation for modern human resources management frameworks and established practices comes directly out of the 50?s and 60?s (yes, including more recent competency analysis and modelling and self-directed work groups, etc.) and is firmly grounded in mainstream management models. Two major waves that sought to review and revise the established practices came with the debate (70?s and early 80?s) over Theory X and Theory Y management philosophies, and the basic steps taken in the 90?s and 2000?s to recognize that the enterprise’s future involves different kinds of knowledge workers than those who dominated over the past40 years. In my opinion, the issues have become more complex over the past five years. Many of the established HR methods and practices depend upon the foundations of traditional management science, and plain and simply did not foresee the rise of pervasive and ubiquitous socially-connected workplaces. Let’s look at each of the main areas of HR, and make some educated guesses as to how the interconnected 2.0 context may affect HR methods and practices. Recruitment is about attracting, finding, wooing and checking out talent – it’s the courtship before the relationship begins. This area of HR felt the dramatic impact of the Web early, in the form of job boards. Job boards and template-based resumes became the norm pretty quickly, given the efficiencies introduced for busy HR people concerned with the first steps of recruitment. There were and are disadvantages, however. Keyword-constrained templates and functionality of most job boards ensured two things; 1) that some interesting and potentially very valuable candidates would be screened out because the match wasn’t precise enough, and 2) many people would be screened in (by using appropriate keywords) who did not really belong in the given recruitment process. As web use and the presence and population of social networking platforms has grown, new dynamics have appeared in recruitment. LinkedIn is a source of much activity, as is the more ‘organic’ word-of-mouth recommendation of people by people who know them. This latter dynamic is, in my opinion, the really important one here. It’s how people operate, and networking to find new work or a more interesting job, or just to make a change, was well underway long before Web 2.0 came around. The Web has just made it … easier, faster and more effective. I expect before long that people will offer potential employers as many references from people they know and have worked / interacted with on the Web as they will from former employers and colleagues. Employee orientation is all about helping new employees “get their feet under the desk”. Supplementing job descriptions and the expectations agreed to upon hiring, an early response to the challenge was the use of an enterprise intranet, with which to support all the information new employees needed to know. However, the real work of getting ones’ feet under the desk requires participation, interaction and ‘learning the ropes’, and here it’s clear that joining into the flow(s) operating in social networks inside an enterprise can be very useful with respect to a new employee’s more rapid and more effective orientation. Many (all ?) of the collaboration / social computing platforms offer features such as profiles, personal tag clouds, and other contextual information that is crucial to effective orientation. Here’s an area that I suspect will come under a fair degree of scrutiny as the adoption and traction of Enterprise 2.0 continues to grow. Job descriptions have a bad rep, and yet are essential in modern organizations, even if they are short and sweet. In many more structured or more bureaucratic organizations, they have become an input and an emblem of power and status, in the sense that their main purpose is often to help peg a job’s position in the organizational hierarchy and the salary, benefits and other perquisites obtained by the job. If they are short and sweet, they tend (in my experience) to be found in organizations that are already by-and-large nimble, adaptive and probably pretty well suited to operating in today’s networked environment. They are an (but not THE) indicator of less bureaucratic organizations. A current example of the needed scrutiny is a growing interest in forms of agreements or commitments, to do what one has said one will do, in a given context. As jobs in the modern world change rapidly and pretty regularly, there’s been growing (but often slow) interest in what I call role profiles. As an aside, I was just last night reading a lecture delivered in 1974 by Marshall McLuhan (mentioned above) in which he noted that the notion of ‘job’ in an electronic era was a relic of a bygone era; in the more rapid electronic environment, he said, we are more clearly engaged in role-playing than we are in carrying out the task of a ‘job’. 1974 !! A well-crafted role profile need be no longer than one page (landscape) and can include all of the essential information (including competencies and learning objectives) related to a given role. Performance management has been a hot-button issue in most enterprises for a long time. At its best, a well-designed and disciplined approach to performance management can potentially play a positive and constructive role in delivering sustained high performance, and can be central to creating a performance oriented culture in the enterprise. All too often, however, performance management schemes serve to remind us that too many workplaces are the adult version of grade school, with report cards and a parent-like boss who has unwanted power over employee’s future and fate. 360-degree feedback processes (soliciting input on performance from subordinates, colleagues, superiors and even external customers and liaisons) have been around long enough now to have most of the kinks worked out, and are probably a decent pre-cursor to forms of ‘crowdsourcing’ input on employees’ performance. Many (most ?) of the social computing / collaboration platforms out there have features and functionality designed to offer support to gathering and processing information about peoples’ performance. However, they often have glitches that make them much less effective than they could be. More recently, there have been rumblings about real-time annotation of performance around events. The culture of an enterprise is an all-important aspect of why and how performance management is used. I expect that this aspect will become more important as social computing and collaboration continues to grow and spread. This is really too big a subject area to deal effectively with here. Suffice it to say that this is an area that over the past five years or so has generated a wholesale review of T & D philosophies and activities. Much of the discussion is aimed at assessing how effective formal learning / T & D has been, and why and how informal, or social, learning is so pervasive and so important. This issue gets at the heart of why social computing and collaboration is a big deal, and is (probably) changing the nature of knowledge work in today’s interconnected environment. It’s important to note here that there will (IMO) always be an important role for structured formal training & development / learning focused on specific aspects of the kinds of information and knowledge needed by workers. It’s also probably the case that much or all of that type of learning will be available online, and offered in various hybrid combinations of virtual and F2F learning environments. For a concise yet comprehensive summary of the core issues and why the impact of the Web is so important in this area, see my colleague and fellow Change Agent Harold Jarche’s “Social Learning in the Enterprise“. In many of my writings about social computing, collaboration, Enterprise 2.0, hierarchy and wirearchy, I have stated that the enterprise-driven process of job evaluation is a real and ever-present challenge to the effectiveness of Enterprise 2.0 adoption and effectiveness. In a vast general sense, levels of remuneration for many types of jobs are determined by job evaluation, a process of ‘measuring’ the amount of knowledge, problem-solving and accountability contained in a job. There are of course other influences like union contracts on specific industries, ‘hot’ (or currently-in-demand) skills, local and regional issues, and so on … but there is clearly stratification in the levels of pay and compensation depending upon the type(s) of work. Remuneration is a subject area that is too vast (and too arcane) to get into here, but it’s one that I expect will experience more and more change as the era of social computing and social networks in the workplace really gets going. I have some ideas on the evolution of this area of HR, mainly gleaned from work I have done in the past on 1) competency-based pay and 2) contribution-based pay. And, to revive a term I have not heard much of for the past 15 years or so, might Enterprise 2.0 help rejuvenate the concept of gainsharing ? Most administrative issues and practices in the HR field were automated in HRIS systems at least a decade ago, if not longer. I am not aware of how Enterprise 2.0 would visit any change to this area of HR management. This is already a too-long post. And, I have not even touched on the ways HR professionals need to change what and how they deliver to meet the challenges posed by Enterprise 2.0. As noted at the beginning of this piece, I am not aware of significant work in the general area of changes to mainstream HR practices as a result of embarking on the path towards Enterprise 2.0. I will be delighted to learn from any of you of examples and / or issues I may have missed or glossed over.